Have you ever wanted to paint out of doors, or if you do paint out, have you wanted the experience to be easier and more successful? Keith Thirgood will show you his own approach to tackling painting en plein air. At it’s core, Keith’s approach to painting en Plein Air is about transferring the feelings you get from your subject onto your painting surface. It’s not about realism, although it works for realism as well. Learn one approach to achieving the simplicity and structure that makes for a good painting, combined with a completely modern approach to colour theory and colour mixing. We explore composition, design, shapes and values. Get these right and you are halfway to a good painting. Keith Thirgood is a largely self-taught artist, painting mainly landscapes. His style has been described as Post-Impressionism in the Canadian tradition or Canadian Reductionism. 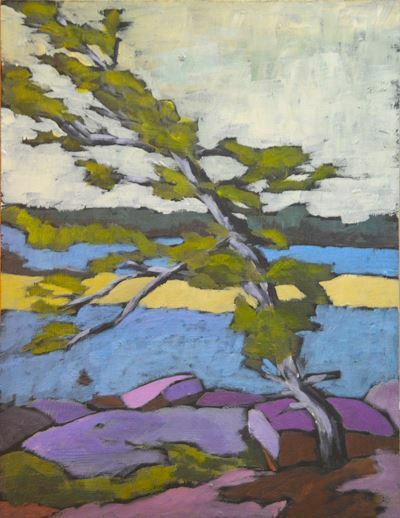 He’s influenced by post-impressionist artists like Van Gogh, Gauguin, Cezanne, as well as Tom Thomson and members of the Group of Seven plus artists like Don Cavin, Mike Svob, and Connie Hayes. Keith is President of the Ontario Plein Air Society, a member of Kawartha Artist Gallery and Studio, Prince Edward County Arts Council, Markham Arts Council, Arts Society of King, Pine Ridge Arts Council, East Central Ontario Art Association (ECOAA) and the Markham Group of Artists. He has taught painting for the Town of Richmond Hill and the Aurora Cultural Centre as well as private students in his studio and in downtown Toronto. Groups such as the Don Valley Art Club, Art Guild of Scarborough and the East Central Ontario Art Association hire him to give workshops and seminars. Keith also runs a number of plein air workshops and retreats every year. In 2018, he’s in Ottawa Valley, Kawartha Highlands Provincial Park and Killarney. Plus, each spring he hosts a number of Plein Air Workshops in the Peterborough area.